Last month, I went to a one-day blogging event over in Southern California, called the So Cal Social. Two very dear blogging friends, Vivienne and Beverly put on the event, and it was wonderful. An afternoon of strolling around Downtown Orange, popping into unique shops of all kinds – including some amazing vintage shops. 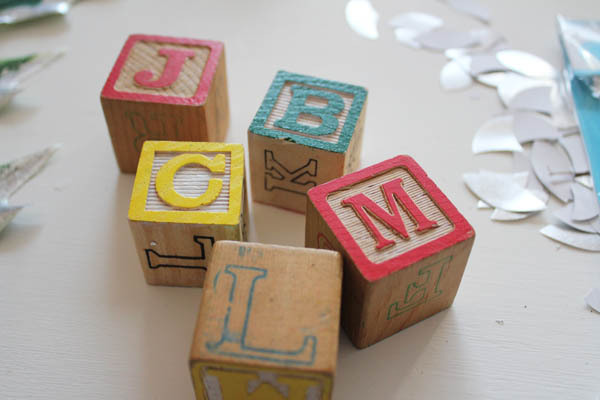 At one of the vintage shops (Vintiques Home Decor)I found a stack of old blocks. 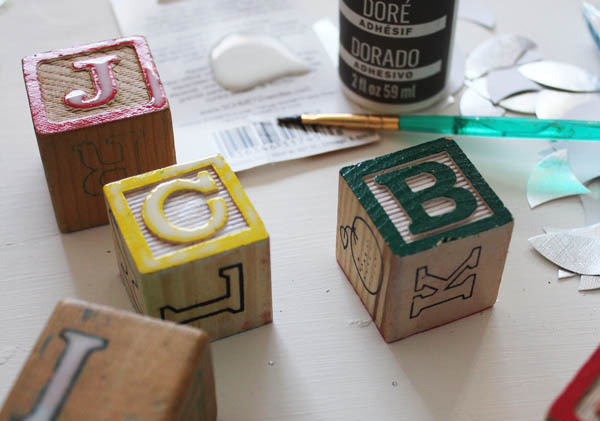 I knew right then that the blocks would be perfect for making custom ornaments. 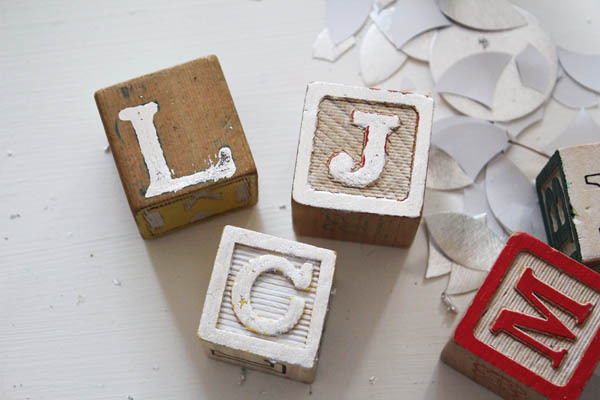 So I dug through all the blocks to find my family’s letters… C, J, L, B. At first I thought I’d just add a hook or loop of some kind and hang them as-is… but then I got the idea to glam them up a little bit with some Gilding. And that’s how today’s Craft Lightning project was born! That’s right… I got so excited sharing all of this I forgot to mention that this week is Craft Lightning week! All week long I’ll be sharing a new fast craft (15 minutes or less) right here, and Angie from The Country Chic Cottage will share a fast craft over on her site. Then each evening, I’ll share a round-up of fast crafts from my blogger pals that are joining in this week. So much fast holiday crafting going on around here… if you can keep up, we’ll have you ready for Christmas before you even have Thanksgiving dinner! Clean off your blocks if they are dirty. Then paint on the gilding adhesive with a fine brush. Just paint the letter and any border. Leave the background alone. 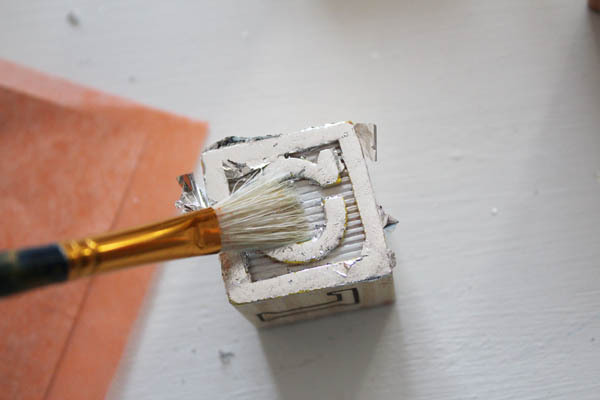 Once the adhesive dries (it took about 5 minutes – you can tell it is dry when it is all clear), push the shiny side of a gilding sheet onto the block. Lift the gliding sheet off. If the gilding didn’t adhere in any areas. Press a fresh part of the sheet back on, and press firmly again, rubbing the gilding into place to secure it to the glue. 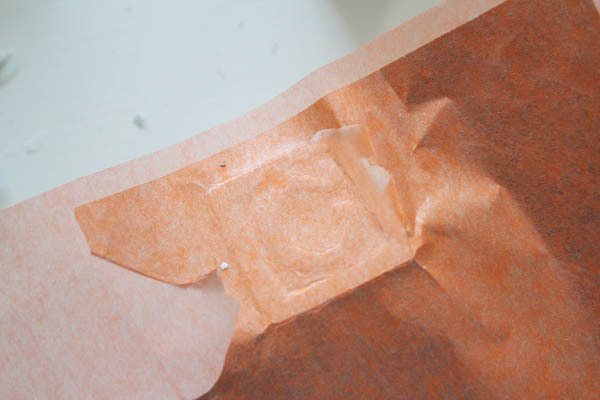 Use a stiff-bristled brush to rub away any excess gilding. I couldn’t find a block with a raised “L”, so I picked this one… I think the gilding really makes it shine. 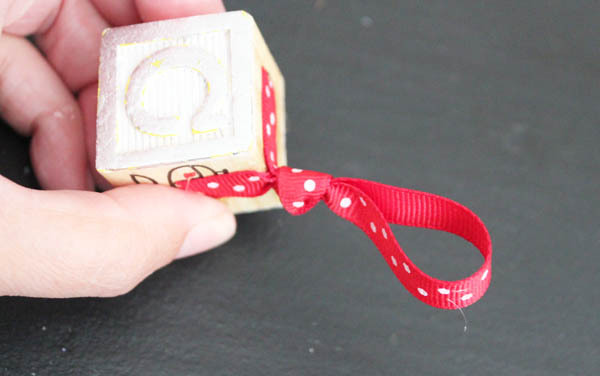 Once your blocks are gilded, grab a length of ribbon, and tie it in a knot. Place the knot on one of the edges of the block, with the two raw edges of ribbon running down different sides of the block. Glue the ends in place. It is that easy! Fast crafts are so addictive, aren’t they? Come back tonight for my Craft Lightning Day 2 Round-up… I’ll be sharing more fast holiday craft tutorials from friends around the web. And if you missed it, be sure to check out yesterday’s Craft Lightning Day 1 Roundup, and yesterday’s Fast Felt Frame Ornament Tutorial. What an awesome idea! 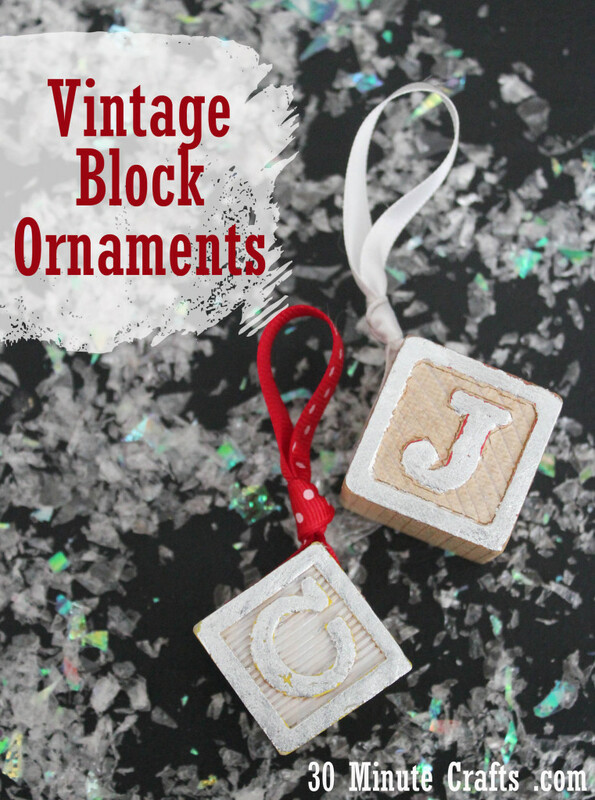 I can’t wait to make a few of these for our tree!